During an impromptu yard sale, Julia M. told her friend Annabelle about Guatemala Aid Fund and they decided to donate all the money they raised that day to help kids in Guatemala. When Annabelle visited her friend Lily over the summer they decided to take on the Caring Kids Summer Challenge, selling lemonade and cookies abd hand painted crafts. The girls presented Guatemala Aid Fund with more than $75 from their sale! Thank you!! Talia and Olivia are two caring motivated girls from the Berkshire region of Massachusetts. They started their own program called "Smiles 4 the Future" to help the Guatemala Aid Fund efforts.They had hoped to collect a few hundred toothbrushes, and they collected 1,500! Below is some text from an eloquently written flyer they prepared to begin collecting toothbrushes for Guatemalan Kids. "In our religion (Judaism) when a child turns thirteen they have a special celebration to be welcomed into the community as an adult. One part of this Bat Mitzvah ritual is the custom to contribute to making the world a better place. We heard about a project called the Guatemala Aid Fund through one of our friends in our Jewish community. The Guatemala Aid Fund has five components, all located in Guatemala. We are contributing to an orphanage for young and handicapped children. We are collecting toothbrushes and toothpaste for these children. They don’t have things as simple as toothbrushes. Healthy teeth and gums are an important part of a lifelong smile. That’s why our project is "Smiles 4 the Future". We would love to find as many of these supplies as possible. We feel very lucky that we have enough to help these kids now and in the future." THANK YOU and BLESS YOU OLIVIA AND TALIA!! We are so proud of you and thank you for your committment to help others. Your supplies were recieved December 20 at the Dental Hospital and two orphanages! Maggie is an active 5th grader at the Dallin Elementary School in Arlington Massachusetts. She was looking for a way to help out others and chose to collect items for the Guatemala Aid Fund. The items she collected were sent in packages with some essential health care items and new shoes for the children at Christmastime. 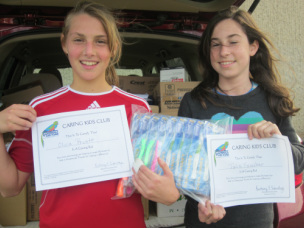 Maggie coordinated a school wide collection and organized the items collected with her school to be sent to Guatemala. The participation was amazing! She is a role model for the other kids in her caring efforts and the response from the community was fantastic. Many members of the school have also been supportive in donating sports equipment for the sale and we thank Maggie and the Entire Dallin Community for their efforts at bettering the lives of the children in Guatemala. Thank You and Bless you Maggie and the Dallin School!!! THANK YOU and BLESS YOU ANDREW!!! Emily Quitzau Helps at the Sports Equipment and Clothing Sale! Emily's enthusiastic and helpful attitude, along with her wonderful artwork on her signs helped bring people into the clothing sale this spring! On behalf of the kids in Guatemala, Thank You and Bless you Emily for all your Great Work!